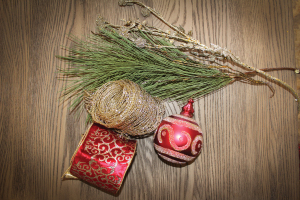 As winter holidays unfold, here are some ideas to simplify, beautify and bring cheer to one’s holiday home. Keep the color palette simple — Sticking to two or three colors makes decorating easy, and the end result looks thought out and put together. Traditional colors such as red, gold and green are Christmas decorating staples, or Christmas can be more whimsical by decorating with teal, pink and silver accents instead. Adding lime green instead of holly green to the red and gold Christmas colors also adds whimsy. Holiday lighting — LED pre-lit trees are a popular choice because they last thousands of hours longer than traditional lights and use almost 80 percent less electricity. LED lights are usually brighter than traditional bulbs so less strands can be used when decorating to get the same visual impact. A Christmas tree should be lit from the top down working in sections rather than wrapping around the tree. Work the lights in towards the trunk of the tree, and then back out to the tip of the next branch. Spotlights can be placed on top of cabinets and aimed toward focal objects that should be highlighted more than the surrounding decor. A spotlight can draw focus onto a wreath hanging on a fireplace or door or a Santa’s face in a table centerpiece. Using good sense — Scents of pine, eucalyptus, apple cider and freshly baked cookies can all be purchased in scented holiday candles. Place candles near your entry and throughout your home to create an inviting holiday sensation. Boiling cinnamon sticks, cloves and oranges will get guests in the holiday spirit. It’s always good to decorate using lots of candles. Nothing makes a room feel warmer and more inviting than candlelight. Mix styles — Try juxtaposing natural elements with sparkle. Don’t be afraid to spray paint an old object with metallic paint and possibly add glitter to create a metallic makeover. Natural elements like branches, leaves, feathers, pinecones and berries make good additions to mix with the metallics so they play off each other. Decor with double duty — Buy ornaments like glass snowflakes and hang them from tree branches either inside or outside when entering the home. Guests will enjoy their beauty during the party and be able to choose an ornament to take with them as a party favor when they leave. Bigger is better — Group collections and display in one area using different levels create more visual interest than spreading the collection around. Instead of hanging individual ornaments on the tree, save time decorating by wiring the ornaments together and using them in a cluster on the tree or wreath. Instead of a traditional bow, ornaments can be hung with varying lengths of ribbon from the top of a wreath to create an unexpected modern look. 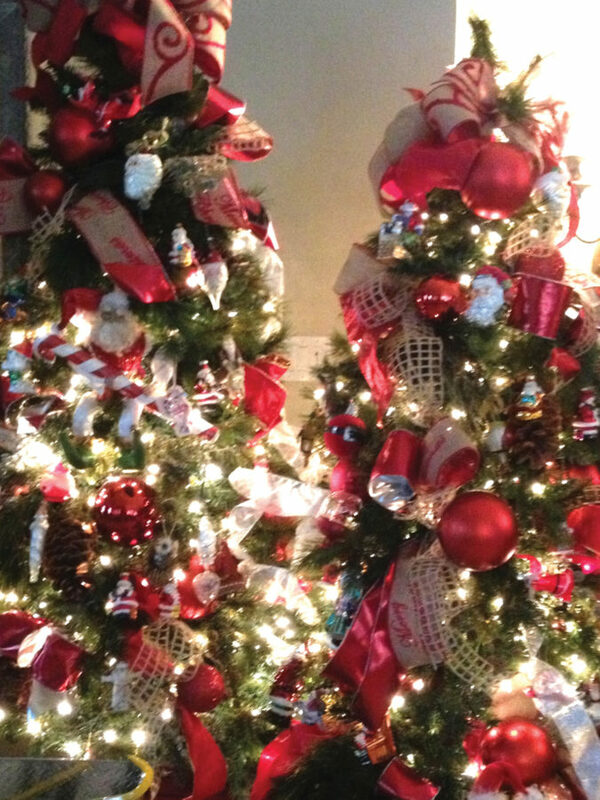 Big oversized ornaments can be placed closer to the tree trunk to make the tree appear to have more depth and create more sparkle. Time savers — Tree enhancers are simple to make and easy to install and make a Christmas tree look larger and more plump and professional. 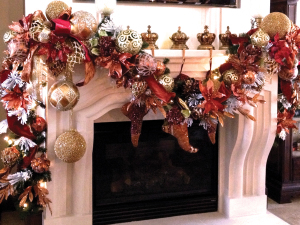 Enhancers combine a long piece of artificial greenery, branches, ribbon, ornaments and maybe a sparkly accent piece. The greenery is layered with a branch, and these pieces are wired together at the top. Then ribbon is tied around the wire and a bow is tied with the tails of the bow hanging to the bottom of the greenery. The ribbon tail is then attached with wire at the bottom and an ornament added, dropping off the end of the enhancer. Sparkly accents can be added and placed in the arrangement. Enhancers made in varying lengths can now be tucked into the Christmas tree. Pre-making enhancers saves time from hanging each of those items individually onto the tree. It’s faster to take the tree down, and they pack really well in a storage tub.